New Posh signing Louis Reed (right) in action for Chesterfield last season. Peterborough United have signed highly-rated young midfielder Louis Reed from Sheffield United. The 20 year-old signed a three-year deal for an undisclosed fee this morning (June 18). Reed became the youngest player to represent Sheffield United in the Football League when making his Blades’ debut as a 16 year-old in April, 2014 against a Rotherham side managed by current Posh boss Steve Evans. He won man-of-the-match. He made 59 appearances for United after graduating from the club’s Academy, 26 as a substitute. Reed spent last season on loan at Chesterfield in their unsuccessful fight to avoid relegation from League Two, scoring four times in 47 appearances. He was voted player-of-the-year by two local newspapers. Reed has also played for England at under 18, under 19, under 20 level. 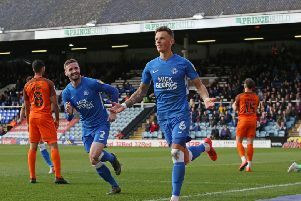 Reed is the eight summer signing by Posh after Aaron Chapman, Rhys Bennett, Alex Woodyard, Matt Godden, Colin Daniel, Jason Naismith and Mark O’Hara.